Take pet grooming to the next level with the Air Force® Top Gun® Variable Speed Pet Dryer by MetroVac. This high performance pet dryer is designed to provide you with faster, more efficient pet drying. With the Air Force® Top Gun® Variable Speed Pet Dryer by MetroVac, you can reduce pet-drying time and get back to business. This high-quality grooming tool features variable speed and heat control that give you full command over the level of blowing power and heat used. It is a versatile pet dryer that allows you to set the strength of the dryer through several different controls. 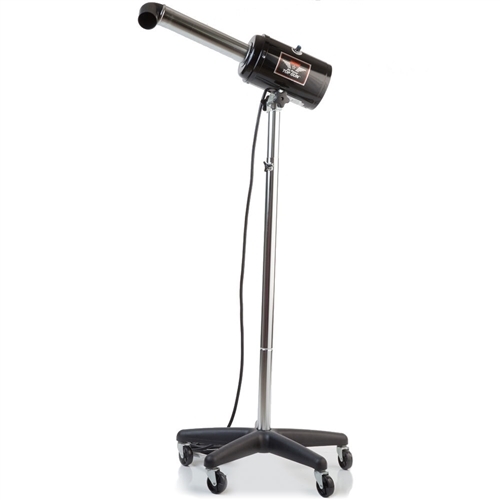 In addition to its many possible uses, the Top Gun® Variable Speed Pet Dryer features an advanced build that ensures it is reliable and sturdy, while maintaining an affordable price. The Air Force® Top Gun® Variable Speed Pet Dryer features multiple heat and speed settings, as well as a stand to help groomers dry even the largest pets. Thanks to this pet dryer, you can create a customized grooming experience that is tailored to each pet’s individual needs!